Everyone experiences a restless night now and again, due to a wide variety of reasons. In fact, the CDC has determined that one in three adults do not get enough sleep. What is considered enough? For adults between the age of 18 to 60, it’s an average of seven or more hours a day. For those one in three people, the associated risk of frequent lack of sleep includes chronic conditions such as obesity, diabetes, high blood pressure, heart disease, stroke and frequent mental distress. 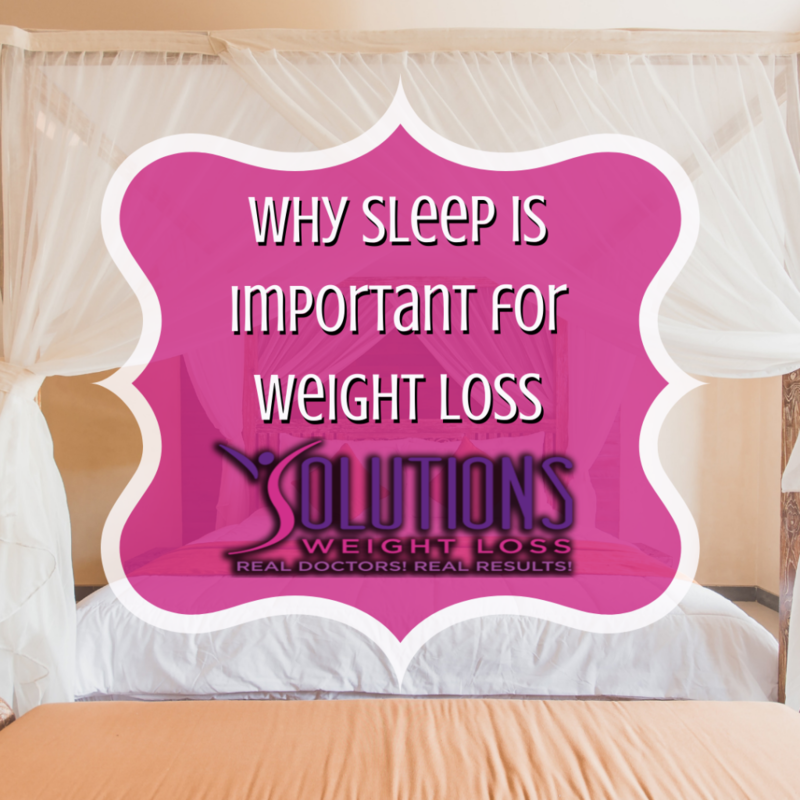 So how does the amount of sleep we achieve impact us in terms of weight loss? Keep reading to learn the potential long-term effects, as well as tips to achieve adequate rest. Dieting requires more than healthy eating. You must have the right mindset and be physically healthy in order to maintain the necessary lifestyle to lose weight. When we lack sleep, these are two areas significantly affected. Commonly, the ability to function properly goes down the drain. Your memory can suffer, reaction time decreases and our ability to regulate emotions becomes difficult. In addition, sleep helps regulate our body temperature, and releases essential hormones. The lack of sleep affects the production of these hormones, which can lead to premature wrinkling and sagging skin, as well as feeling colder than usual. Our immune system is also compromised, resulting in an increased risk of infection or disease. Finally, our appetite can go into overdrive. Our ability to determine if we are satiated is affected, causing us to eat more and gain weight. Unfortunately, all of these side effects take a toll on our ability to properly maintain a healthy diet or meet weight loss goals. When we are tired, we often mistake our discomfort for hunger, leading us to eat too much or unnecessarily. This makes portion control difficult and cravings hard to control. Impulse can become particularly hard to overcome. It can also deal a harsh blow to our metabolism. Too little sleep can cause a spike in cortisol, a hormone that signals our body to conserve energy. Therefore, our body will reduce its normal use of whatever fat is available, and preserve it. Similarly, our body also becomes less sensitive to insulin, which turns sugars, starches, and other foods into energy. Unable to process fats effectively, or body will also store the incoming fats in excess. While at times it may not seem likely, getting a good night’s rest is not impossible. Specific conditions can make it difficult, but several lifestyle measures can help you get back on track. 1- Follow your natural sleep-wake cycle – By following your body’s natural circadian rhythm, you will sleep a similar number of hours each night, so that you consistently wake up feeling refreshed and energized. To help, avoid sleeping in, even on the weekend. Similarly, do not go to bed too early, or you may wake up in the middle of the night. If you are struggling during the day and must nap, do not sleep for more than 20 minutes. 2- Be cautious of your exposure to light – A naturally occurring hormone, melatonin, is controlled by light exposure and regulates our sleep-wake cycle. When it is dark, your brain secretes more melatonin. To stay awake for adequate hours, expose yourself to direct sunlight, especially in the morning. At night, use soft lights and do not use devices within one to two hours of your bedtime. 3- Exercise regularly – Regular exercise for just 10 minutes a day can drastically improve your sleep. The more vigorous, the better the benefits. However, you should not exercise too late into the evening, or it may have a re-energizing effect. 4- Eat well – How you eat overall is important, but especially leading up to your bedtime. Do not consume caffeine, alcohol or sugary drinks that may interfere with your energy levels. Drinking too many liquids may also make you have to urinate frequently during the night. Spicy or heavy meals can cause heartburn or indigestion, and make staying asleep difficult. 5- Wind down before bed – Many people work themselves into a fit when they can not fall asleep. Instead of making sleep a goal, try to calm your mind down. Do this by limiting your activity levels before bed, and staying off of stimulating technology. For additional help, try learning to meditate, with the help of the app Headspace. At Solutions Weight Loss, we understand that there is more to weight loss than a diet. With our licensed and friendly medical staff, you will have the encouragement and guidance necessary to help you reach your goals.Contact us today to schedule an appointment, and get started on your path to a healthier lifestyle. 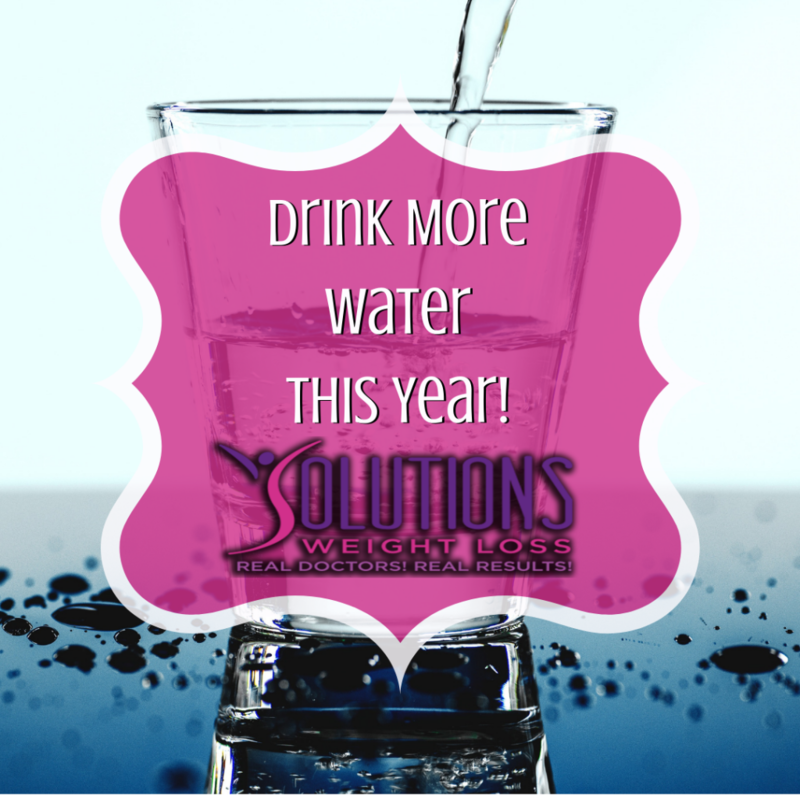 Drink More Water This Year! You have heard it time and time again: drink more water. Yet the message has never completely stuck. In 2013, it was estimated that nearly 75% of the population was functioning in a chronic state of dehydration. As water makes up about 60 percent of our body weight, it is a principal element for our health and survival. Learn why we need to drink water, the recommended daily amount, and the plethora of benefits this relatively simple habit delivers to our body. On average, the Mayo Clinic recommends that men drink about 15.5 cups daily. Women should consume 11.5 cups daily. Since we often ingest some water through other foods and drinks, becoming seriously dehydrated is difficult. However, without regularly taking in the entire suggested amount, you may experience a number of mild side effects. These can include dizziness, fatigue, confusion and dark-colored or frequent urination. Likely to subside if you consume the adequate amount of water, if these symptoms persist or you can not keep fluids down, you should see your primary physician. When you do consume the appropriate amount of fluids, you are likely to be surprised by just how good you feel. Water is essential for organ, muscle and tissue function, as well as the lubrication of joints. It regulates your temperature, and helps rid your body of waste and toxins – through urination, perspiration and bowel movements. Even more impressive, water can have anti-aging effects. By keeping our body properly hydrated, our skin improves, reducing the appearance of fine lines and decreasing the occurrence of blemishes. Although the Mayo Clinic has found that regular water is good enough for most people, several variations are available. Here are two commonly available types of water, as well as the pros and cons of consuming them. Alkaline water – Alkaline water refers to the pH level, which is higher than that of normal water, typically of 8 or 9. This is believed to help neutralize the acid in your body, which some claim can assist with anti-aging, colon-cleansing, immune system health, weight loss and more. None of these have been backed by scientific research, although too much alkalinity does have known side effects, and can lead to metabolic alkalosis. Distilled water – When all of the natural minerals in water have been removed, a pure from of water remains. Achieved through a process called reverse osmosis, this is a demineralized water. In some locations, distilled water can be healthier than tap, depending on the level of impurities in the municipal water supply. However distilled water can absorb materials from anything it touches, sometimes including plastic containers. While forming any new habit can be difficult, there are several steps you can take to assist your newfound motivation. Installing a home water filter will provide high-quality water. Several varieties are available – such as faucet-installed, countertop and pitcher models. Or consider home delivery of spring water or distilled water. Also, take the time to find out how you enjoy drinking water. Some people prefer using a water bottle, or a straw, for a variety of reasons. No matter how you get the water down, what works for you is what is right. If you need a little extra help, you can set a reminder on your phone. The free Daily Water – Drink Reminder app is available on the App Store, while similar apps for Android devices are available for free on Google Play. After a few weeks of strict reminders, reaching for the water bottle should become second nature. Keeping well-hydrated is part of a healthy lifestyle that includes reaching and maintaining a healthy weight. Solutions Weight Loss offers a program to fit the unique needs of each patient. Our team of licensed and friendly medical staff gives you the encouragement and guidance to help you stay on track or get back on track until you reach your goals. Contact us today to get started on your weight loss journey! Ranked by U.S. News & World Report, The Flexitarian Diet placed third in the ‘Best Diet Overall’ and the ‘Best Diets for Diabetes’ category in the 2018 Best Diet Rankings. It also placed second in the ‘Plant-Based Diets’ and ‘Easiest Diets to Follow.’ With all of these high accolades in mind, consider whether you might benefit from the Flexitarian Diet. Learn how it works, and how it can help you achieve your health goals. The term flexitarian came from the combination of two words, flexible and vegetarian. The diet encompasses both of these concepts, wherein followers consume a large quantity of fruits, vegetables and whole grains, while still enjoying the occasional animal product. Overall, a follower’s goals should be to actively decrease their consumption of meat. Founder Dawn Jackson Blatner, RDN, suggests that beginner participants should initially eat meat no more than five days a week. In total, you should have no more than 26 ounces combined during these days. Remember, as mentioned in our blog post about the Zone Diet, use the hand-eye method. A serving close to the size and thickness of your palm is around 4 ounces. As you continue, this weekly allowance will decrease to three or four days of meals featuring meat. Do not exceed more than 18 ounces of meat a week during this advanced stage. Finally, as an expert, you will consume meat only two days a week, with a maximum of 9 ounces total. It is recommended that you proceed at your own pace, so that you may adjust to less quantities of meat, and new eating habits. What can you look forward to on this diet? Use the following list of approved foods to create your own Flexitarian Diet meal plan. 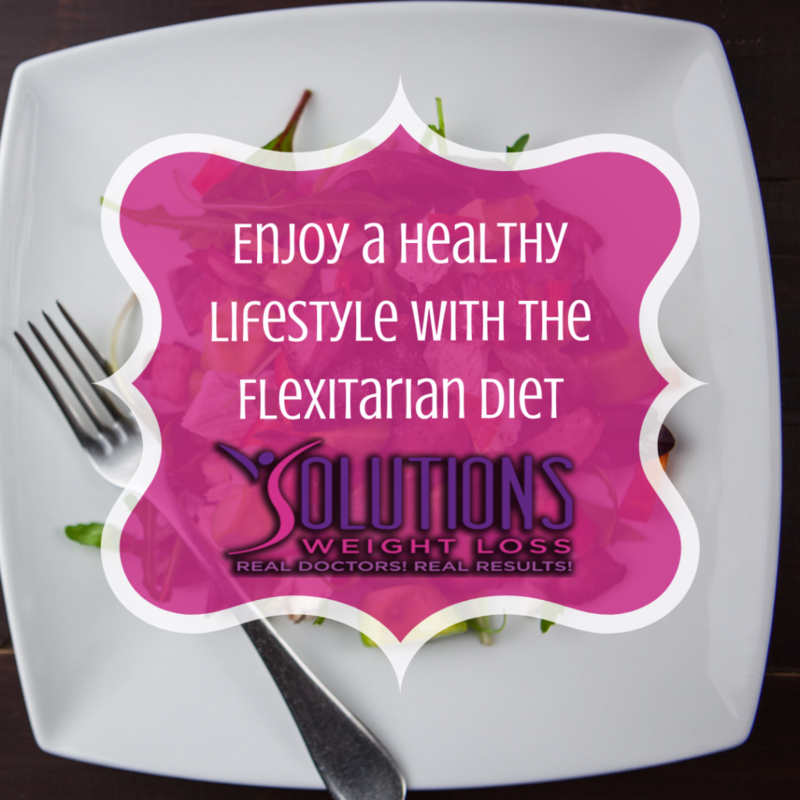 If you have difficulty compiling your own, you can find Flexitarian Diet recipes online. For participants, following the comparatively simple Flexitarian food pyramid, is well worth the benefits. Largely plant-based diets have shown to improve heart health significantly, reducing a person’s risk of heart disease by 32%. This is likely to the increased intake of fiber and healthy fats, which reduce blood pressure and increase good cholesterol. For these same reasons, it may also help prevent or manage diabetes and decrease your risk of cancer. Outside of your health, the Flexitarian Diet presents benefits for the environment as well. Studies have shown that the reduction of meat consumption will help sustain natural resources, as well as decrease greenhouse gas emissions. In turn, this will allow land to be used to feed humans, rather than the animals that feed us. So, not only can you feel better physically, but you will know you are contributing to something larger. At Solutions Weight Loss, our team puts the “woo-hoo” back into weight loss. With the proper encouragement and support, you will discover that weight loss does not have to be a struggle. Contact us today to learn more about our program, and the success of our patients.